RETURN TO SULLIVANS ISLAND - Why and Why Now? The world is blowing up around us. Retirement accounts have evaporated; people can't even afford their own divorce. Wall Street, the housing crisis, credit markets, Detroit, scams, unemployment and the accompanying terrors of it all! I have been so bombarded with bad news. I am certain my readers have been too. So, how can we make ourselves feel better? One answer is to escape through a book to revisit a funky little sandbar like Sullivans Island, a place steeped in history and populated with the kind of characters Tennessee Williams would have loved to have known. This enchanted island is a place where what you have is enough, where shiny things don't matter and your grandmother's wooden spoon is a treasure to hold. Like Oz, the greens are greener, edges are sharper and the water and sky are impossible shades of blue. Flip flops and sandals are the only shoes you need and the fragrance of homegrown tomatoes and jasmine in bloom takes your breath away. You can eat fish that was swimming that morning. Watch a sunset so spectacular you'll be brought to tears. Walk the beach at night pondering the Milky Way overhead. Sit on the dark porch of the Island Gamble and sort out your life with old friends. These are just a few of the things RETURN TO SULLIVANS ISLAND offers to save us from the dreary outside world. And then there's family. In RETURN TO SULLIVANS ISLAND I plucked the daughter of the protagonist, Susan Hamilton Hayes from the original story and dropped her front and center in the sequel. Watch and see what happens when Beth's whole family averts their eyes to pursue their own dreams and she is left to come of age in a hurricane of her own making. Fortunes are at risk, hearts are broken, disaster strikes. But the magic of the island and the spirits of their ancestral home bring them all back together as the power of their love for one another finds forgiveness and healing. Why would I write a sequel to SULLIVAN'S ISLAND, perhaps my most popular book, knowing sequels can be the kiss of death? 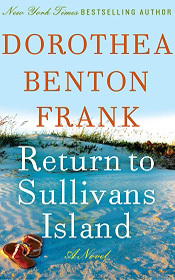 I wrote RETURN TO SULLIVANS ISLAND because I adore the place, I have missed those characters and I believe with all my heart they still have lessons to teach us. And because, in these challenging times, I wanted to give my readers a story I hope they will all love because success is not always measured in money. You'll be the judge of that.